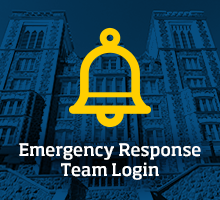 This guide contains generally recommended emergency responses. Actually emergency responses must address the uniqueness of each situation. The recommendations presented in this booklet may not be appropriate in every circumstance. Use caution, common sense, and good judgment in approaching any situation. If under the circumstances the recommendations found in this guide might reasonably lead to injury or damage, do not use them. Students, faculty and staff of College of St. Scholastica should make themselves familiar with the information and procedures outlined in this guide. Please refer to the College's programs and policies for detailed information.